MediChest Large by Carex is an excellent option for securely holding large daily pill regimen. 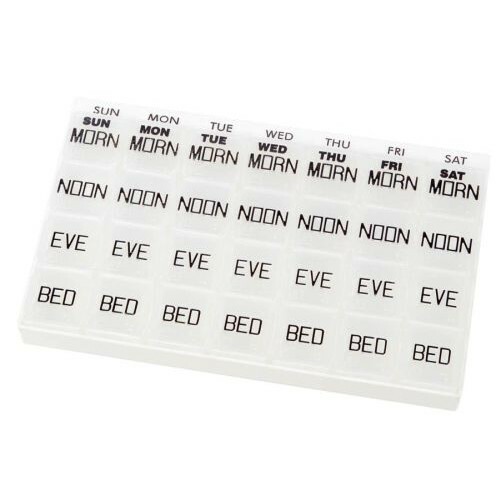 Boasting the same quality features as the MediChest Original with a greater storage capacity, this MediChest will help you ensure that you never have to miss a pill or vitamin again. The MediChest Large features seven individual dayplanners that can be removed for travel, easily fitting in most backpacks, purses, or suitcases. The easy-to-open, extra-large compartments offer plenty of room for storage. The lids stay securely closed while moving about, yet can easily open with the simple push of the thumb. 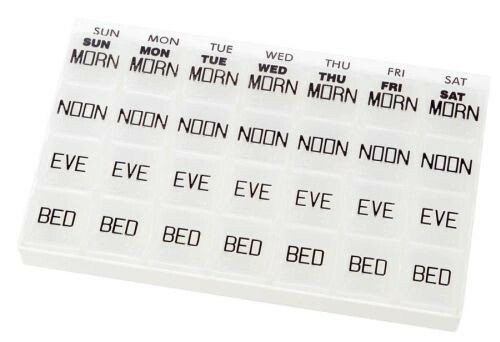 Vitality Medical also carries other Pill Organizers and Calendars, such as the One-Day-At-a-Time 7 Day Pill Organizer. Features 7 Individual Dayplanners That Can Be Removed to Take With You. Easy-to-Open, Extra Large Compartments Hold Vitamins and Medications. Four-Part Compartments Marked For Morning, Noon, Evening, and Bedtime. Braille Markings and Raised Letters For the Visually Impaired.